The Santi Apostoli is one of the oldest churches in Florence, but it is not as old as some Florentines zealously believe it to be. It is located in the Piazza del Limbo. “Limbo” is a slightly denigrating term for someone from the Dutch province of Limburg, so on my first trip to Florence way back in 2010, I took a picture of the street sign for one of my colleagues at work, who is from Limburg. Little did I know that Limbo is the place where, according to Catholic doctrine, small children go to when they die before being baptised. They have not committed any sins themselves, but have not been freed from the original sin by the sacrament of baptism. As a result, they cannot be admitted to Heaven, and have to stay “in Limbo”. The church was built in a children’s cemetery, hence the name of the Piazza. Religion can be cruel. 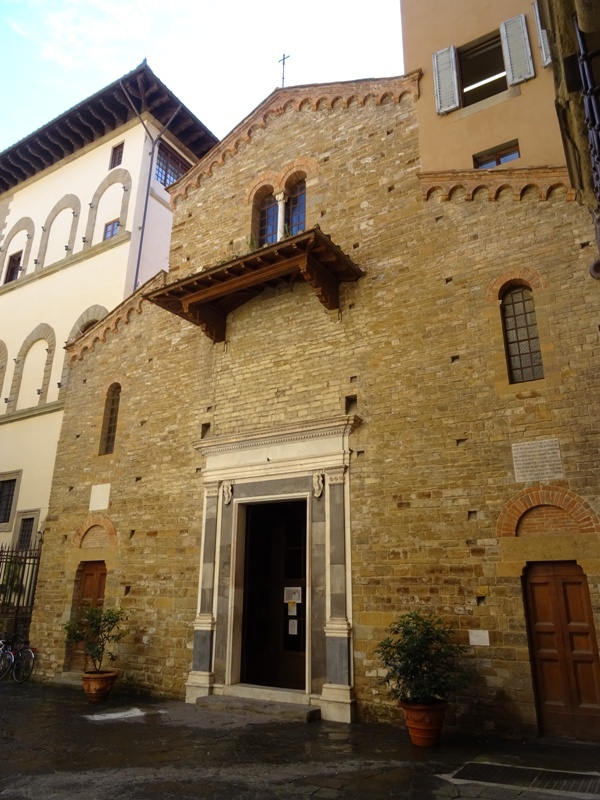 In the Roman era, this part of Florence – the Borgo Santi Apostoli – was outside the city walls. The river Arno and the public baths of Roman Florence were nearby. A slab with a Latin text above the left entrance attributes the founding of the church to Charlemagne. It relates how on 6 April 805, upon returning from Rome, Charlemagne, King of the Franks, entered Florence and was greeted with great joy by the population. The Ecclesia Sanctorum Apostolorum was subsequently founded and consecrated by the archbishop Turpinus, with two of Charlemagne’s trusted paladins, Roland and Oliver, present as witnesses. This was all recorded on a lead slab, which was placed inside the altar. 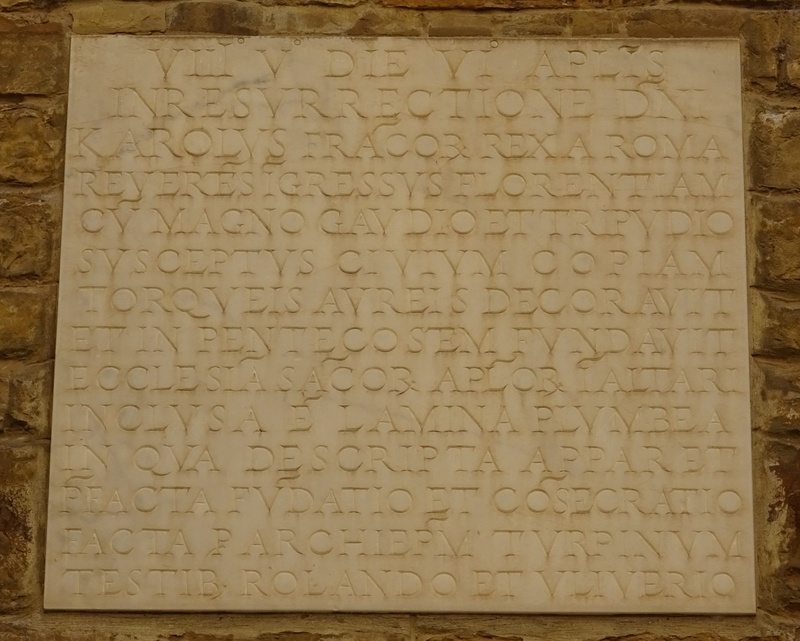 Slab about the founding of the church. The slab is certainly very old, as it was already mentioned by Vasari in the preface to his Lives of the Most Excellent Painters, Sculptors, and Architects. However, the story does not make any sense. Turpinus (or, more correctly, Tilpinus) was archbishop of Reims in France. Why would a French bishop consecrate a church in Florence, which had its own bishop? The church is supposed to have been founded in 805, but Roland had already been killed at the Battle of Roncevaux Pass in 778, and his (fictional) friend Oliver had died with them. This story is of course told in the epic Chanson de Roland. It is best to consider the story on the slab as a prime example of wishful thinking. So when was the church built? My travel guide gives a date of 1059-1100 and we can indeed assume that it dates to the eleventh century. Much of its original Romanesque form and style has been preserved. There is a tradition that claims that we have Michelangelo to thank for this. When the church was remodelled in the sixteenth century, the great artist is supposed to have convinced the project’s principal financer, a banker named Bindo Altoviti (1491-1557), to show some restraint. Some changes were made, however, and the chapels in the aisles – especially the right aisle where one can find Vasari’s Allegoria della Concezione – are clearly not medieval. The small bell tower of the Santi Apostoli, barely visible because the church is hemmed in between other buildings, is the work of Baccio d’Agnolo (1462-1543). 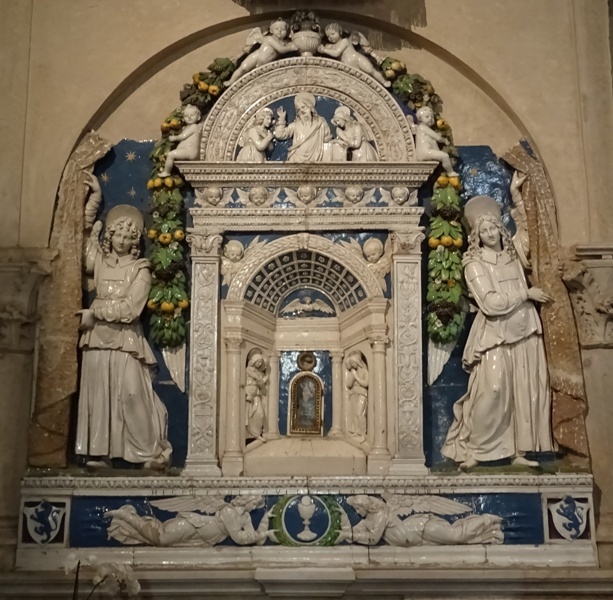 The entrance to the church is through a portal that has been attributed to the architect and sculptor Benedetto da Rovezzano (ca. 1474-1552). The nave of the church has certainly retained the look and feel of a Romanesque basilica. We see walls of plain brick, a roof made of decorated wooden beams and rafters (added in 1333), columns of green marble from Prato with Roman capitals (some of them presumably taken from the nearby Roman baths) and light pouring in through the windows of the clerestory. On the high altar is a polyptych attributed to Jacopo di Cione (ca. 1325-1399) and Niccolò Gerini (died 1415). The subject of the altarpiece is The Madonna Enthroned with Saints and Angels, and since the saints have been labelled, it is not hard to identify them. On the left we see Saints Lawrence and John the Baptist, while on the right the Saints Franciscus and Stephanus the Protomartyr are shown (it looks like Stephanus has Mickey Mouse ears, but these are actually the rocks that were used to stone him to death). 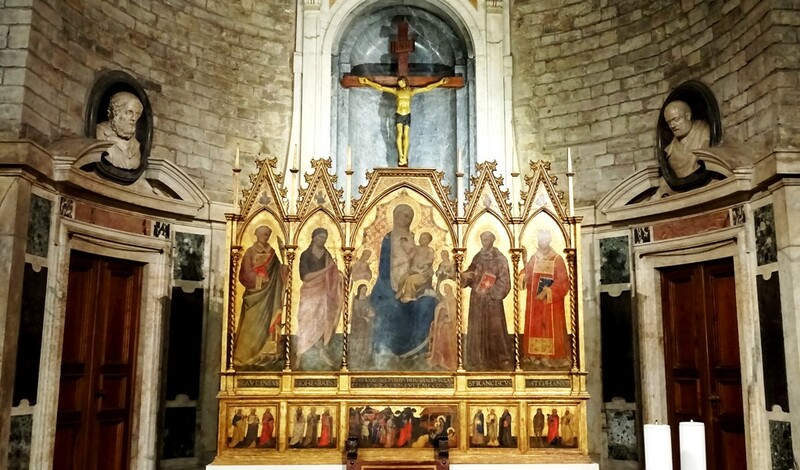 A text below the Madonna indicates that the polyptych was painted in 1383 and was restored in 1423. Jacopo di Cione had an older brother named Andrea (ca. 1310-1368), who was nicknamed Orcagna. Andrea Orcagna painted the original altarpiece of the Santi Apostoli, a triptych known as the Pentecoste, which is now in the Galleria dell’Accademia in Florence. Also of interest is a colourful glazed terracotta tabernacle by Giovanni della Robbia (1469-1529). It can be found at the end of the left aisle. 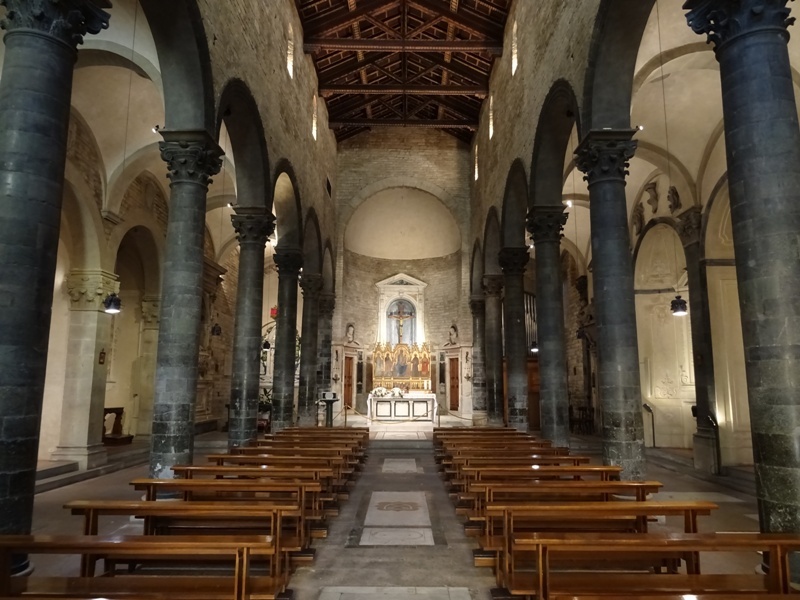 The church possesses three flints that are called the Pietre del Santo Sepolcro, and which according to tradition were used to light the lamps of the Holy Sepulchre in Jerusalem. The same tradition claims that after the First Crusade, a young knight brought these flints to Florence, where they were kept in the Santi Apostoli. The flints are still used in the annual ceremony of Lo Scoppio del Carro, the Explosion of the Cart. A description of this ceremony, which is held on Easter Sunday and involves fireworks, can be found here. Sources: Dorling Kindersley travel guide about Florence & Tuscany, Italian Wikipedia, Churches of Florence, Visit Florence.